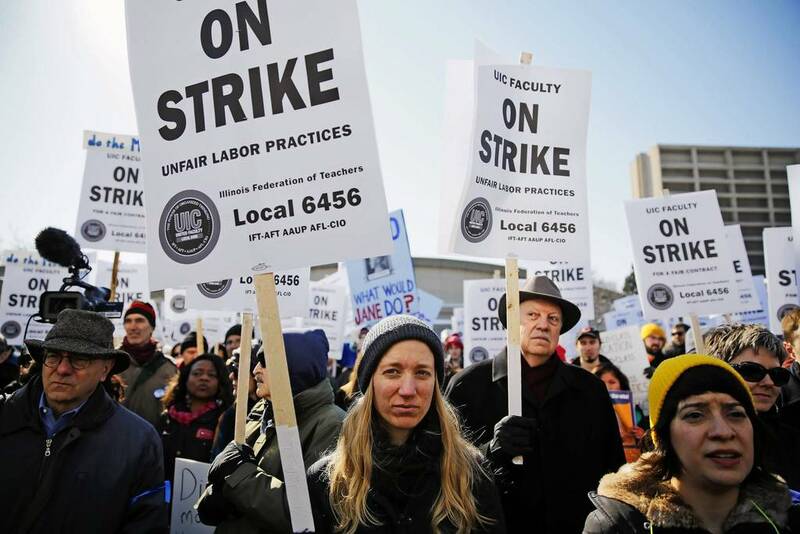 Striking for the first time in school history, hundreds of faculty members of the University of Illinois at Chicago stood outside in picket lines and campaigned for higher wages and long-term contracts on Feb. 18 and 19. The faculty negotiated with the university administration since last August for greater wages, according to the UIC United Faculty. The school cited low funds as a reason why the initial demands of the faculty haven’t been met. A plethora of classes were cancelled on the consecutive protest days, as even a few UIC students joined in on the protests with their professors. Among the issue of low wages, the faculty is also seeking multiyear contracts, a living wage for non-tenured faculty and better classroom conditions. Junior Evan Kreft described the process of UIC professors joining the picket lines and also talked about how the important strike information was disseminated to the student body. Heithmar, along with other students from other organizations at UIC, helped join their professors in rallying for the cause. “There were several student organizations like Students Organizing for Socialism, United Students Against Sweatshops and Roots of Justice, as well as teaching and graduate assistants, who made up the Campus Worker Student Coalition,” Heithmar said. She went on to explain how the differing and diverse student population contributed to their faculty’s plight. Joe Persky, a UIC economics professor and UICUF President, recently told Chicago Tonight that the faculty desires a living wage and better job security. According to CBS Chicago, the faculty is seeking $45,000 for non-tenured faculty, and the administration has countered with $36,000. While low wages dominated the news headlines in regards to the faculty demands, there were more harrowing details to their case than originally conceived. Heithmar also mentioned that over the past five years, tenured faculty positions have decreased by one percent, and administrative positions have increased by 10 percent. “It is clear who is being prioritized and valued at UIC,” she said. UIC officials said in a written statement that the union’s proposals would boost total expenditures by roughly 23 percent for tenured faculty and 27 percent for non-tenured faculty. The two sides met Feb. 21 and 24, and even though a few articles of the faculty’s proposal have been agreed upon, there has been no complete resolution, as of yet.